Deep-Cut Studio gives you more terrain options for your post-apocalyptic gaming sessions with their new War Pigs gaming mat. 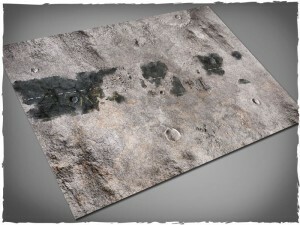 New miniature games mat is available in our webshop! It expands the selection for those playing alternative modern or futuristic wargames. Needless to say, it’s the usual highest quality print on the premium class vinyl material. The mat comes in three sizes (4x6, 4x4, 3x3 feet) but we can adjust it to your table as a custom work too. Check it out at our gallery for some visual aids and close-ups.